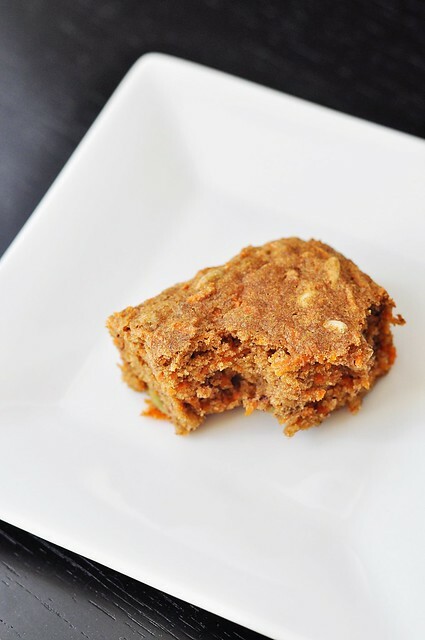 Since a good number of you told me you made my Carrot Cake with Maple Icing to celebrate the spring holiday last year, I thought I’d revisit it, veganize it, and make it all-around a little healthier for this spring. Plus, it’s one of my father-in-law’s favorites; it was important that I come up with a reliable vegan version so that I can still bring it to family gatherings. 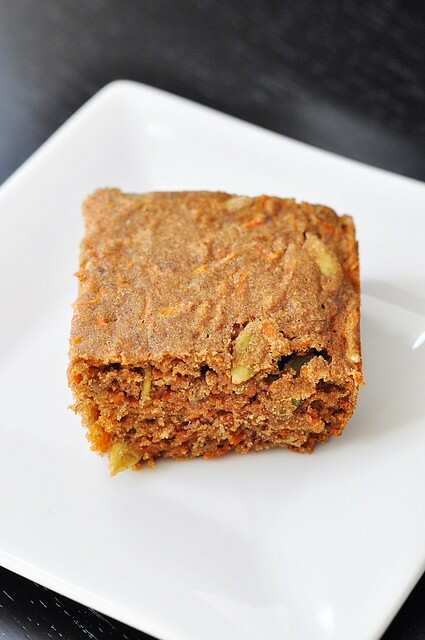 I probably don’t need to sing the praises of this cake all over again, but let’s review: hearty and wholesome with teff flour, packed with sweet orange threads of carrot, intriguingly spiced with cinnamon, cardamom, and nutmeg. Plus, the occasional crunch of chopped nuts or–if you used up the last of your walnuts on the first test batch like I did–seeds. With or without the icing, it’s a real treat. As you can see, I’ve been enjoying mine without. Not only is this iteration vegan, it’s also oil-free! (That deserved an exclamation point, right?) And I can assure you that the crumb is still every bit as moist and tender as the original–if not moreso. And just so you know, I snuck a banana in there too. With all the chocolate that happens around this time of the year, I wanted to make sure you guys were getting a little fruit with your veggies…in your cake. Preheat the oven to 350 degrees. Spray an 8-inch square baking dish with cooking spray, or brush with oil. In a small bowl, stir together the ground flaxseed and 3 tablespoons of water. Set aside to allow a gel to form. In a large bowl, whisk together the teff and sorghum flours, the potato starch, xanthan gum, baking soda, baking powder, cinnamon, nutmeg, cardamom, and salt. Mash the banana thoroughly in the bottom of a medium bowl. Add the sugar, the flax gel, and the vanilla and whisk to combine. Whisk in the water. Add the wet ingredients to the flour mixture and whisk just until mixed. Stir in the grated carrots and then fold in the chopped nuts. Pour the batter into the prepared baking dish, spreading evenly, and bake for 30-35 minutes, until the cake feels firm when gently pressed in its center. Allow to cool completely before serving and/or icing. In a small bowl, whisk together the confectioner’s sugar and maple syrup until smooth. Pour prepared icing onto the cooled cake and spread gently with a spatula. Ice cake just before serving. *½ cup confectioner’s sugar, scooped unceremoniously and leveled with a finger, not sifted—an equal weight of sifted confectioner’s sugar would be 1 cup in volume. This icing will come together just fine without the sugar being sifted, so scoop away.